It’s a Hollywood film themed slot game which we’re putting under the microscope here. Bridesmaids is based on the 2011 movie of the same name and certainly introduces the glitz and glamour you would expect on the red carpet. Boasting actual clips from the movie and symbols for each of the six main characters, the Bridesmaids slot is sure to be a massive hit with fans of the flick. Even players who haven’t seen the film, though, will like the slot’s generous payouts and its whole of additional gameplay features. 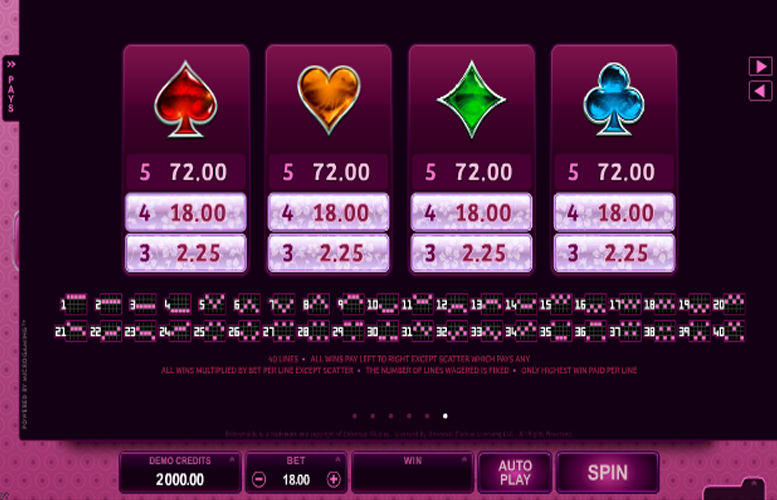 Wild symbols, two types of free spins and numerous bonus rounds all work to make the slot really fun and immersive. Character symbols, real clips from the movie and an enjoyable soundtrack make the Bridesmaids slot a really high quality and attractive game to play. Payline jackpots are really quite generous, with the top main game symbol combination paying out fully 600 times a player’s line bet. The slot has a huge number of bonus rounds and additional features which make gameplay really fun and enhance winning potential no end. The game’s movie-specific bonus rounds and gameplay features will perhaps be a little lost on those players who haven’t seen the film. A comparatively limited range of available coin values and an inability to alter the number of active paylines, mean that players don’t have quite as much choice as they might like when it comes to their size of bet. However you’ll find the biggest jackpot of 105,000 available during bonus rounds – so get triggering! If three, four or five of the slot’s cupcake scatter symbols appear on the reels at once, the Wheel Bonus is triggered. 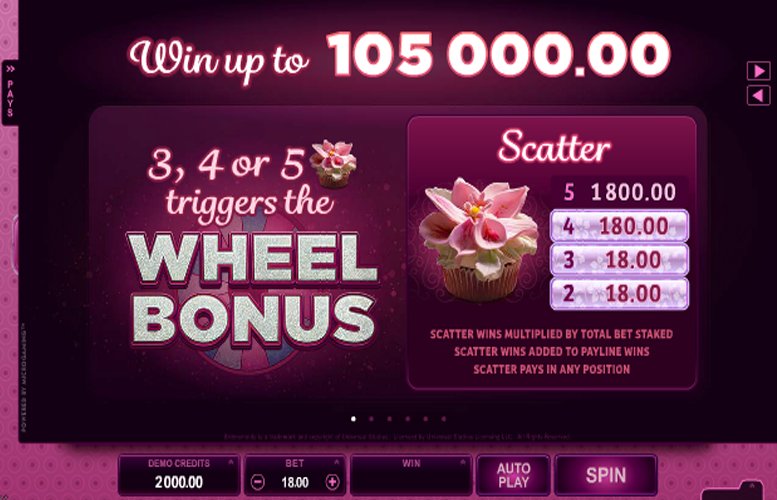 The wheel then determines whether ten Friendship Free Spins, ten Flying High Free Spins, the Boutique Bonus Round or the Magic Moments Bonus Round are triggered. The Boutique Bonus Round is essentially a pairs game, where players must match images of the bridesmaid characters. Doing so successfully earns a player either cash prizes or bonus multipliers. The Magic Moments Bonus Round, meanwhile, awards cash prizes for every magic moment selected before the round is randomly ended. Cupcake Boosters can also be awarded by the Wheel Bonus. Those boosters apply multiples to certain types of prizes and wins. 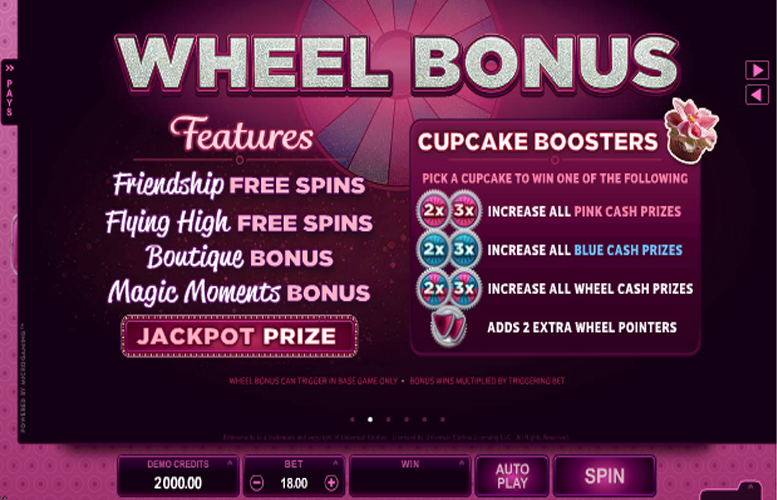 The aforementioned Wheel Bonus can trigger ten of either the Friendship or the Flying High Free Spins. Friendship Free Spins boast potentially very beneficial stacked character symbols, whilst Flying High Free Spins feature growing wilds and a Rolling Reels feature, which rewards multiple consecutive wins with a multiplier. There are only four symbols on the Bridesmaids reels, other than the character symbols, scatter and wilds. Each of those symbols depicts one of the four traditional suits from a pack of playing cards, and five symbol combinations of any of them pay out at a rate of 160 x the line bet. Bridesmaids has a set number of 40 paylines, all of which are always active. What players do have control over, however, are the number of coins wagered per payline and how much each coin is worth. Anywhere between one and 15 coins can be bet per payline, but the range of available coin values is perhaps a little limited, being between 1p and 20p. Overall, that means that the minimum total bet per spin is a total of 40p and the maximum is a total of £120 (15 coins worth 20p each for each of the 40 paylines). 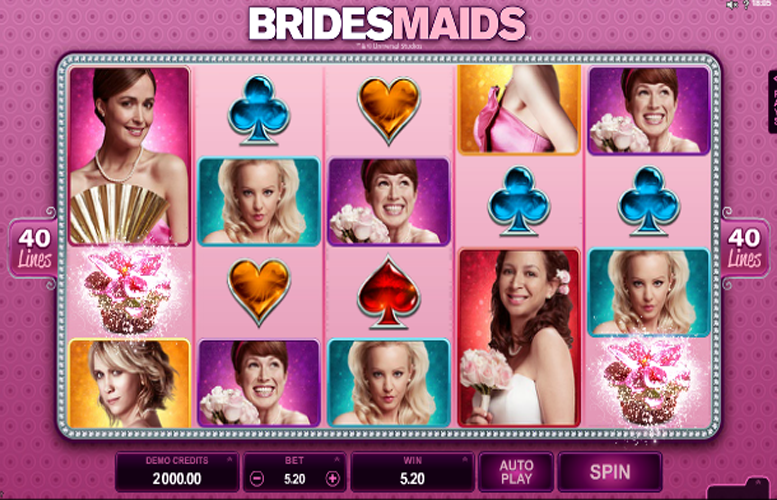 It is often the officially licensed slot games based on movies which deliver the best gameplay experiences to players, and Bridesmaids is no exception. The slot features a well-designed main game, as well as two separate types of free spins and a multitude of bonus rounds. All of those extra features make the slot really immersive and also allow for some pretty nice wins. The payline jackpots within the base game are perfectly decent, too, but higher rolling players may be disappointed that the maximum you can bet per payline, per spin is only £3. 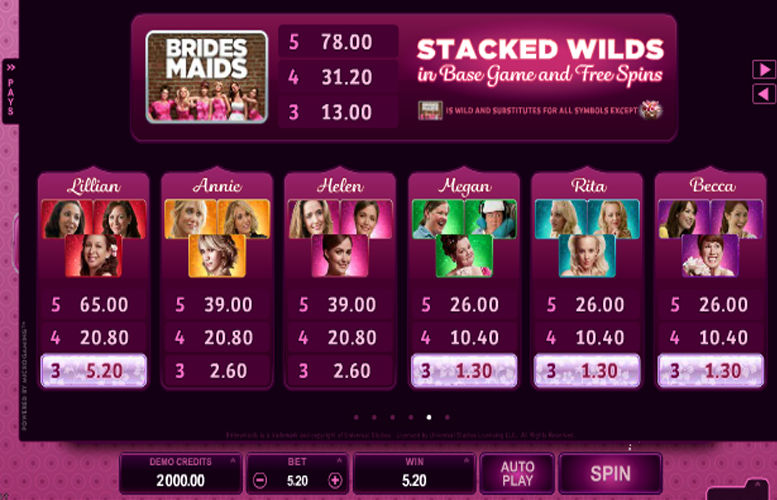 The degree of choice when it comes to how much you can bet per Bridesmaids spin, in fact, is a little limited and is perhaps the game’s biggest weakness. This game has a rating of 4 / 5 with 783 total reviews by the users.